Columbus Criminal Attorney Gives the Scoop on DUI Checkpoints | Yavitch & Palmer Co., L.P.A. 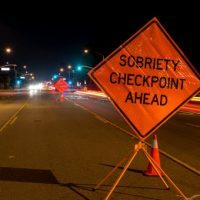 Stopped at a DUI checkpoint? Here’s what you need to know. You’re driving home from a night out with your friends when traffic begins to slow, and you notice red and blue lights flashing distinctly up ahead. You think, Maybe someone got pulled over for speeding, or maybe it’s an accident. Then you notice the officers are inspecting every vehicle as it passes by, and you’re suddenly aware of the lump in your throat. DUI checkpoints are designed to funnel traffic through an area where officers can observe and question drivers in order to determine if they’re intoxicated. While DUI checkpoints can pop up anywhere, at any time, they are usually more frequent during holidays or near large events where alcohol is being served, such as sports games, fairs or festivals. Sometimes you don’t even have to drive though the DUI checkpoint in order to get caught. This past year, Cleveland police have been setting up fake drug and sobriety checkpoints. Basically, the police will set up a sign that says “Sobriety Checkpoint Ahead” or “Drug Checkpoint Ahead.” The thing is, there is no actual checkpoint. Instead, police merely watch the traffic, and go after people who begin to drive suspiciously after they get spooked by the sign. As the holiday season approaches, more and more DUI checkpoints will be placed in strategic locations around the city. Of course, the best way to avoid any issues with a DUI checkpoint is simply not to drink and drive. However, if you get stopped and arrested at a DUI checkpoint, call the professional, experienced Columbus drunk driving attorneys at Yavitch & Palmer at 614-224-6142. Or use our contact form to schedule an appointment at our downtown Columbus office.